I wanted a simple recipe so I read through half a dozen that I found on various websites and it came to this. 4 cups of diced rhubarb that I had in the freezer from last summer. I put everything in a big pot and turned up the heat and started stirring. I stirred at the beginning a lot as there wasn’t yet much liquid, the rhubarb was still frozen. Took a little while to boil for this reason as well. Turned it down a bit and I let the whole thing boil steadily for about 7-8 minutes stirring lots. Then I scooped into half pint jars that were cleaned up and sterilized nicely. Put the lids on and wait for the popping. 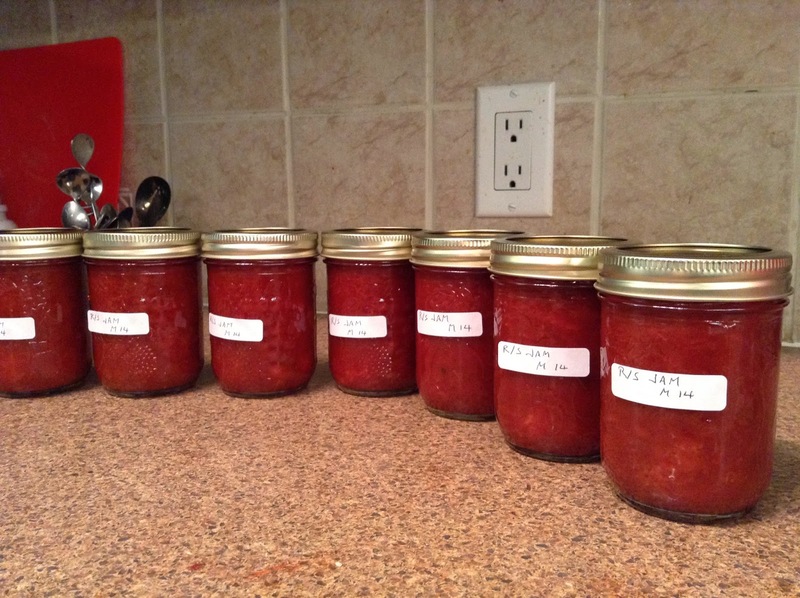 I was able to get 9 of these little jars filled with jam. Pretty simple really. Never done this before and was way easier than I thought it would be.